Sup everybody? 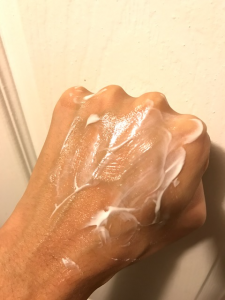 Thought I’d finish up writing about the last of the Sebamed products I’ve tried by reviewing on one of their most popular moisturizers: the Sebamed Moisturizing Cream. To quickly summarize everything I will discuss — it’s a very very basic formula that’s great for those with sensitive skin, or who simply want to take a break from using products with many active ingredients. On the surface level it doesn’t seem like a moisturizer that does much, but you’d be hard pressed to discover how much hydration it gives the skin. I’m still undecided whether I like this or the Sebamed 5% Urea Cream more. (More about this in a bit.) Let’s discuss ingredients! Like I said, this one is very simple. Check it out. Better known as vaseline. Some of you reading this may be thinking that having vaseline in a moisturizer is unappealing or will clog pores and lead to breakouts. Let me assure you that petrolatum is among one of the safest and most non-comedogenic ingredients on the market today. If I had to wager, or place my bets on a single ingredient that’s the least likely to cause people problems — vaseline would be it, hands down. Why do I say this? For one, its uses in skincare date back to 1859! (1) It was only up until recently that the smear campaigns against mineral oil and vaseline began. Interestingly enough, you can actually eat mineral oil without experiencing adverse side effects…. But I digress. Preventing TEWL is a primary way of keeping skin moisturized because it locks in the skin’s water content. The more that water evaporates from the epidermis, the drier skin becomes. And this is where petrolatum comes in to save the day! Vaseline is the most effective occlusive on planet earth, and is capable of preventing up to 98% of transepidermal water loss (TEWL)! Year after year, scientist test out new ingredients and nothing ever beats the good ole’ petrolatum. 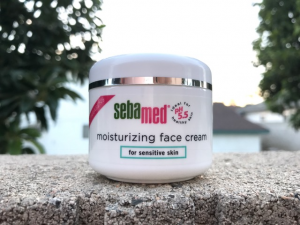 The fact that it’s the second ingredient in the Sebamed Moisturizing Cream, means this product will go quite some ways in retaining the skin’s moisture. Or it’s less scientific name — vitamin E. You know, that gooey liquid inside those capsules you once put on your face because you heard it was good for treating acne scars. No? Just me? Okay, never mind…. Anyway! Vitamin E may help treat skin discoloration because it suppresses tyrosinase, which is an enzyme that catalyzes the production of melanin (the pigment that gives skin its color). Some studies have also shown Vitamin E can treat dermatitis, and a few mice studies have shown it’s good for burn injuries. One of the only downsides about this moisturizer because fragrance can be irritating for some people. If you suspect you have sensitivities to it, then it’s probably best to avoid this facial cream. 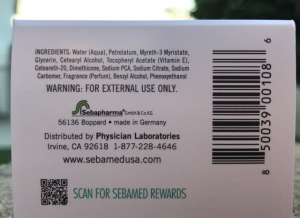 Essentially what Sebamed has done with this moisturizer is kept it very vanilla. 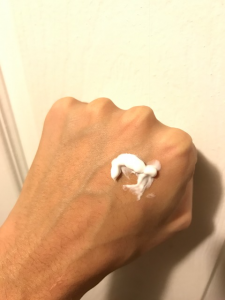 They’ve eliminated almost everything that could potentially cause people problems, which was there intention considering this moisturizer is marketed for sensitive skin. And of course like all the products in the Sebamed line, it is pH balanced as well which is great for overall skin health and integrity. This formula actually reminds me a lot of the types of lotions people make when they have their first go at crafting creams at home. With all that said, it’s a great moisturizer if you’re looking for something very plain that will hydrate the skin pretty deeply. However, I am undecided whether I like the Sebamed Moisturizing Cream or the Sebamed 5% Urea Cream more. Because the urea cream has almost the exact same formula but with the addition of urea in it (duh)! In case you don’t know, urea is a keratolytic agent that hydrates the skin, but also provides some very gentle exfoliation. I’ve written pretty extensively about urea elsewhere on this blog. But it’s my absolute favorite keratolytic agent because unlike many chemical exfoliants it is non-drying and recommended for those that have extremely dry skin. In fact, you’ll often see urea put into foot creams because its so effective at treating the very dry chapped skin that’s a common issue on the soles of feet. 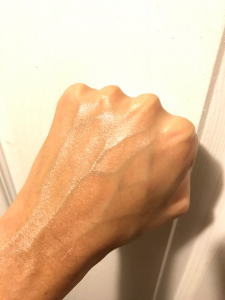 The first time I used Urea it quite literally melted off the dry skin and granular texture I was chronically experiencing. Back then, I would get dead skin build up on my face no matter what I did. If you haven’t struggled with this personally I cannot explain to you how ANNOYING it is. It doesn’t matter how often you exfoliate or moisturize, you’ll have dead skin build up and a dull looking face by the end of the day. Anyway, I introduced Urea and bam — kissed those skin problems goodbye. Haven’t looked back since. I make sure to use urea in my skincare routine at least 2 to 3 times weekly. 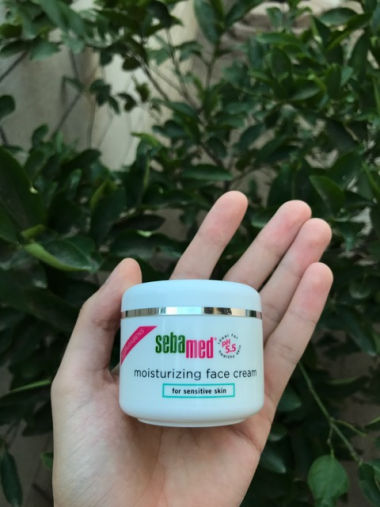 However, the Sebamed Moisturizing Cream is surprisingly rich and provides a lot of hydration. I’ve tested the both of these out, and I’m not sure which one moisturizers better. Both seem to do a very good job. I’d imagine that the the moisturizing cream does comparatively well against the urea moisturizer because it has petrolatum (vaseline) in it. The takeaway being this: if you’re looking for something super plain ole’ Jane, than the Sebamed Moisturizing Cream is your best bet. However, if you want some added exfoliating benefits because your skin looks particularly dull than the Sebamed 5% Urea Cream is a better option (full review here, in case you’re interested) — however, the urea cream comes with some added cost. It goes on pretty thick but has a very smooth consistency. From the looks of it you would imagine that it’s hard to spread like a butter, but the opposite is true. It spreads and glides super easily. You can definitely feel this creams richness on the skin. It doesn’t leave a tacky feeling per se, but there is a slight stick to it. It’s one of those moisturizers that you can tell has a big impact on hydrating the skin when you wake up the next morning. I have no other way of explaining this. It just does a very good job of sealing everything in, which is particularly noticeable upon waking and examining your skin. I’m not normally a fan of scented moisturizers, but I got to say I absolutely love the smell of this thing! It’s a very clean scent. Kinda like a nice refreshing green dove bar soap. It reminds me of the scent you have or smell after getting out of the shower. Where I normally get headaches from fragrances, this one actually relaxes me quite a bit. A basic pH-balanced formula without the addition of any active ingredients. This is as vanilla as it gets when it comes to a creamy moisturizer. Moisturizes the skin very well. Not much else to say here. :p I’d normally deduct a point for such a plain formula, but considering it’s pH balanced and its intended for sensitive skin types — less is probably better. Goes on thick but spreads easily. Leaves a slight shine behind. Smells glorious. Would have been nicer if this formula came inside a squeeze bottle, or something with a pump dispenser. Jars aren’t the most sanitary containers, and require you to use spoons or q-tips to scoop out the product. This thing is dirt cheap, which makes it a steal. I believe it’s actually the cheapest product in the Sebamed line. A solid and basic moisturizer. I would recommend this or the Sebamed 5% Urea Cream for anyone looking into trying a creamy moisturizer from the Sebamed line. If you prefer a no-nonsense, bare-bones moisturizer than the Sebamed Moisturizing Cream is a great option. However, if you want some added exfoliation thrown into the mix and don’t mind the additional cost, than the Sebamed 5% Urea Cream is your best bet. Let me start off by saying, you are a LIFESAVER! I’ve literally been on your website since morning (it’s almost midnight) reading all I can. You truly have a goldmine of information and I’m so grateful to you as I’ve finally figured out whats going on with my face having tried everything that wasn’t working (after months and months of terrible breakouts and frustration). Seem I have fungal acne too so I’m excited to finally know what is going on and start working on it. I’m in Dubai so lots of the moisturizers are readily available or named differently. I tried to get the Sebamed Gel but couldn’t find it so settled for the Moisturizing Cream. I noticed it wasn’t included in your safe product list on the other page, however, I cross referenced all the ingredients and it seems wouldn’t feed the buggers. Can I use it or should I wait to order something on the safe list. Hi, What do you think about layering both Sebamed moisturizers? If so, how would you layer them? had to ask ya, if you have fungal acne, how did you use this product ? isn’t the ester listed problematic for FA ?